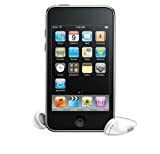 Amazon is offering this HOT deal on a iPod Touch 8 GB (second generation) for just $158! This is the best deal I’ve seen out of pocket all season long. .-= Kari Terhune´s last blog ..The Parents Connect 3D Pregnancy Widget =-. I think it's finally time I got one of these, especially at that price. Might help me get through sleepless nights with a newborn. By the way, do you pay for wifi or does it just pick up whatever is out there that's free?